The mixed tocopherols market was valued at USD 3.66 billion in 2016, and is projected to grow at a CAGR of 5.4% from 2017, to reach USD 5.27 billion by 2022. The base year considered for the study is 2015, and the forecast period is from 2016 to 2022. Mixed tocopherols are used by food & beverage and feed manufacturers to meet the global consumer demand for vitamin E-rich products. Mixed tocopherols are widely used as a source of vitamin E by pharmaceutical and dietary supplement manufacturing companies. They are extracted from different sources such as soybean oil, rapeseed oil, corn oil, and sunflower oil through the vacuum extraction method. The factors influencing the mixed tocopherols market growth include health & wellness trends such as vitamin fortification in food & beverages and in feed, and regulations for sourcing, processing, packaging, and labeling of food & beverages. This report includes estimations of the market size in terms of value (USD billion) and volume (KT). Both top-down and bottom-up approaches have been used to estimate and validate the overall market size and the size of various other dependent submarkets in the overall market. The key players in the market have been identified through secondary research, some of the sources are press releases, paid databases such as Factiva and Bloomberg, annual reports, and financial journals; their market share in respective regions have also been determined through primary and secondary research. All percentage shares, splits, and breakdowns have been determined using secondary sources and were verified through primary sources. The figure below shows the breakdown of profiles of industry experts that participated in the primary discussions. The leading players in the mixed tocopherols market are considered for this study. A brief description of the companies and their products are mentioned in the company profiles. Detailed insights on the key strategies and recent developments of the are provided. The global market for mixed tocopherols is dominated by large players such as DuPont (US), ADM (US), DSM (Netherlands), Sigma Aldrich (US), and BASF (Germany). The overall mixed tocopherols market is projected to grow from USD 3.66 billion in 2016 to USD 5.27 billion by 2022 at a CAGR of 5.4%. Mixed tocopherols are generally considered as ingredients that are intended to be consumed as part of the diet and contain vitamin E, they offer the potential to enhance health or reduced risk of diseases. The mixed tocopherols market is driven by the growing health consciousness & increased life expectancy among consumers, rising cases of chronic diseases, and applications of mixed tocopherols in feed, food & beverage, and dietary supplements. Mixed tocopherols are used by food & beverage and feed manufacturers to meet the global consumer demand for vitamin E-rich products. Mixed tocopherols are widely used as a source of vitamin E by pharmaceutical and dietary supplement manufacturing companies. The mixed tocopherols market is diversified and competitive, with a large number of players, including large conglomerates, mid-tier companies, and start-up firms, though the market is dominated by a few large players. The mixed tocopherols market is witnessing a shift, due to rising customer concerns for a balanced diet and growing incidences of chronic diseases. Food & beverage and feed manufacturers have been fortifying their products with mixed tocopherols to enhance their health benefits. 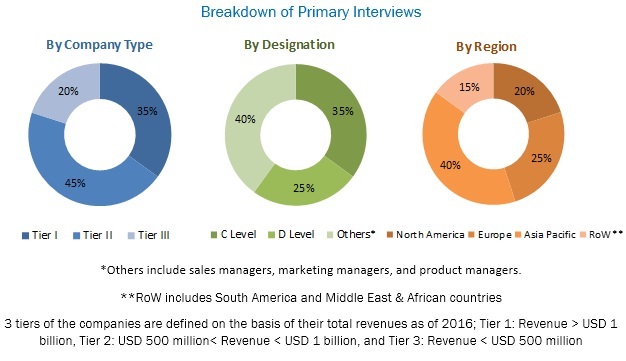 The mixed tocopherols market has been segmented, on the basis of application, into food & beverage, feed, dietary supplements, pharmaceuticals, and cosmetics. The market for cosmetics is expected to grow at the highest CAGR between 2017 and 2022. Among all the applications, the feed has the most common mixed tocopherols application. Mixed tocopherols have various functional characteristics; they can function as antioxidants, preservatives, nutrient stabilizer, and flavor protectors. These features increase the demand for mixed tocopherols in various application industries. The mixed tocopherols market in APAC is expected to grow at the highest CAGR during the forecast period. The increasing urban income has led to the growth in domestic mixed tocopherols demand. They are natural antioxidants, and since the consumers in the Asia Pacific region are shifting their interest towards products derived from natural sources, the mixed tocopherols market is expected to grow at a good pace in this region. Factors supporting the growth of mixed tocopherols market include increasing consumer demand for natural sources of vitamins and nutrients and increased urban income that can be used for nutritional supplementation for human or pet usage. 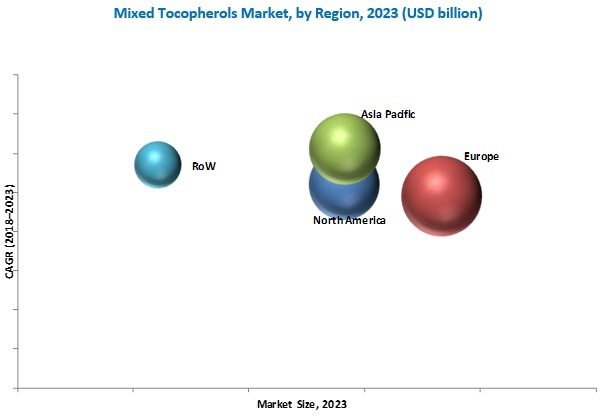 The rising demand in emerging economies, rising number of government initiatives, and growth in various food & beverage applications are expected to create new growth opportunities for the mixed tocopherols market. Mixed tocopherols are used in food & beverage products to fortify them with vitamin E. When added in food & beverage products, they increase their nutritive value. Mixed tocopherols are used in food & beverage products as they act as antioxidants, which help prevent oxidation in cells, reduce the risk of cell degradation, and prevent diseases such as cancer. They are used in food & beverage applications such as baked goods, cereals, dehydrated potatoes, oils & fats, convenience foods, meat & egg products, nuts & seeds, and functional foods & beverages. Since mixed tocopherols are an excellent source of vitamin E and fat-soluble in nature, they can easily blend with feed. An approved amount of mixed tocopherols in feed prevents the ill-effects of severe heat stress on egg production, egg weight, and eggshell density. They also help in the formation of eicosanoids in the membrane, which is a potent inflammation inducer. Mixed tocopherols combined in feeds aids in increasing the overall immunity, meat, skin, nail, and fur quality in animals. Mixed tocopherols are the most biologically active forms of vitamin E. They help in preventing heart diseases; due to their antioxidant properties, they disrupt a chain of events that lead to plaque build-up in the arteries. They also support healthy blood vessel function and improve metabolism, faster healing, improving vision, and increasing immunity. They are known to prevent other chronic diseases and cancer. Tocopherols prevent the fats and fat-soluble vitamin A stored in the body from breaking down and combining with other substances that may become harmful to the body. Mixed tocopherols also help combat neurological disorders. Globally, there is a significant rise in the number of people suffering from chronic ailments such as obesity, diabetes, blood pressure, and cardiovascular diseases. In 2002, the increasing instances of chronic diseases such as osteoporosis, cancer, cardiovascular diseases, hypertension, and diabetes due to the lack of essential nutrients, caused around 29 million deaths worldwide. This scenario has led to rising demand for mixed tocopherols, which are widely used as a preventive medication for chronic diseases. Due to such incidences, the market for mixed tocopherols is projected to grow in the pharmaceutical application. Mixed tocopherols are the most commonly used forms of vitamin E in cosmetic products. They have antioxidant properties, due to which they are gaining importance in cosmetics application. These properties of mixed tocopherols help to stabilize oxygen-sensitive ingredients in cosmetic formulations, protecting them against oxidation. Anti-oxidizing also helps in protection against skin aging. They provide protection against sun damage as well as repair sun damage. They stimulate collagen production and protect existing collagen by inhibiting matrix metalloproteinase [MMP] that degrades collagen. Mixed tocopherols have anti-inflammatory properties and increase the rate of wound healing. They also aid in increasing the shelf life of the products, as they act as natural preservatives. What are the upcoming industry applications for mixed tocopherols? The mixed tocopherols market is diversified and competitive, with a large number of players, including large conglomerates, mid-tier companies, and start-up firms, though the market is dominated by a few large players. The factors influencing the mixed tocopherols market growth include health & wellness trends such as vitamin fortification in food & beverages and in feed, regulations for sourcing, processing, packaging, and labeling of food & beverages. Mixed tocopherols are used to fortify various food products such as baked goods, cereals, dehydrated potatoes, meat & egg products, and oils & fats. The mixed tocopherols market is driven by the growing health consciousness & increased life expectancy among consumers, rising cases of chronic diseases, and applications of mixed tocopherols in feed, food & beverage, and dietary supplements. The key players in this market are ADM (US), DSM (Netherlands), BASF (Germany), DuPont Danisco (US), Sigma Aldrich (US), Nutralliance (US), The Scoular Company (US), Vitae Naturals (Spain), B&D Nutrition (US), Davos Life Sciences (Singapore), and Cofco tech bioengineering (China). These companies use strategies such as acquisitions, expansions & investments, agreements, joint venture & partnerships, and new product launches/developments to strengthen their position in the market. 12.12 Mixed Tocopherols By Cofco Tech Bioengineering (Tianjin) Co., Ltd.
14.11 Cofco Tech Bioengineering (Tianjin) Co., Ltd.